That attention to detail can be found throughout the rapidly expanding space. The Googlers (never referred to as employees or staff) are particularly proud, for example, of all the food options on-site — a cafeteria that serves healthy meals every day, free of charge, as well as five “micro-kitchen” snack bars. At Google, though, a snack bar is far from a hasty collection of soda, chips and cookies. The company discovered that people are more likely to take food that they can see, so mango slices sit in a clear jar, while candy hides in an opaque white one. 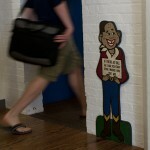 Healthy drinks are put at eye-level in coolers, to encourage employees to stay away from the soda on the bottom shelf. Every detail is purposeful. The Kennywood touches continue around every corner — for example, every room is named after a popular ride, and an faux admission ticket boldly hangs on every door. 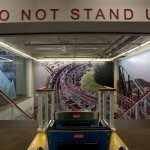 Photos of the park, many taken by the Googlers, adorn the walls, as do signs made by Matt Palm’s Old Glory Sign Co. (the subject of our March 2012 Personal Space column). And hiding around one remote corner is the mysterious Zoltar, a life-size, animatronic fortune teller in a glass box. 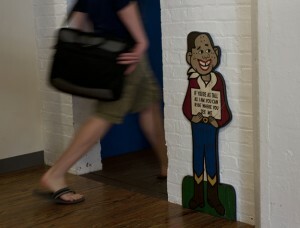 That’s a pretty safe bet at Google Pittsburgh. 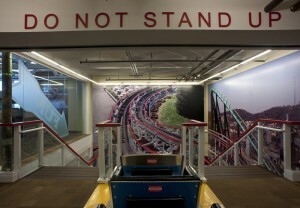 Just around the corner from all the energy of the Kennywood artifacts is the wellness area. A “non-conference” room for quiet, free-form discussion leads into a massage room, where Googlers can receive free massages three days a week. It’s enough to make any visitor jealous. Fortunately, while we can’t all drop into the offices and chill, there are plenty of ways that Google works with Pittsburgh. Google gives grants to a laundry list of local nonprofits (from Pittsburgh Cares and Pittsburgh FIRST to the Mattress Factory and Girl Scouts Western PA, to name a few). They invest in green technology and projects. They’re constantly engaged with local K-12 groups and Carnegie Mellon University, where Google Pittsburgh originally opened. And they just released a report that can put a dollar value on Google’s impact on the local economy: more than $1.6 billion. So yes, it’s a great place to work, but Googlers are also among Pittsburgh’s best neighbors, in an ever-growing number of ways. 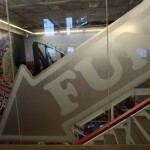 And the expansion into the Kennywood floor (as well as the lease on another floor of the facility, which Google is holding for future expansion) is a tacit commitment that the company’s integration and involvement with the city is only growing. Past the Potato Patch-themed micro-kitchen and the office’s pooch, a laid-back bulldog named Trixie, you can wind your way back up to the sixth floor, overlooking an open stairway that’s designed to look like the Thunderbolt track itself. 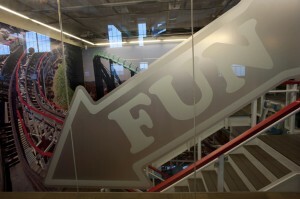 The stairs flow into a giant, two-story photo of the ride, and the crowning piece, between the “tracks” of the staircase, is a custom-made Thunderbolt car. Google worked with Kennywood to build it, so obviously every touch is perfect, down to a switch that turns on a wildly oscillating headlight (a former mainstay on Thunderbolt cars). 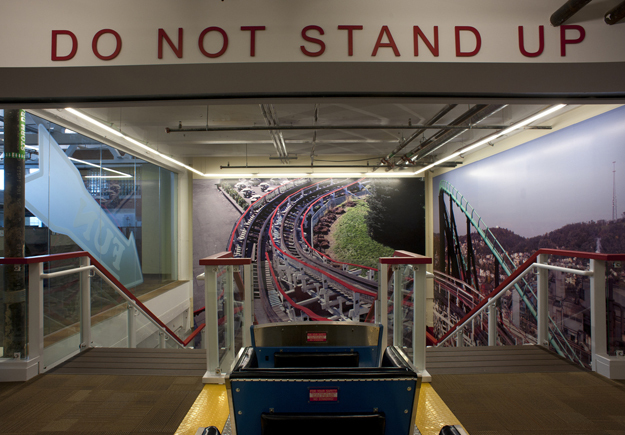 The roller coaster cart sums up Google Pittsburgh, if that’s possible: Great attention to detail, a sense of playfulness and wonder, engagement with the community and its history — and, most importantly, ever-present cool. Pittsburgh’s most incredible workspace? No doubt about it.